Preheat oven to 220ºC, gas mark 7. In a large shallow dish, make a marinade by blending 2 tsp Cooks’ Ingredients Tarragon & Paprika Rub with 2 tbsp olive oil. Add a 340g pack essential Waitrose British Chicken Mini Breast Fillets and toss to coat evenly with marinade. Place 350g from a 1kg pack Waitrose Frozen Chunky Potato Wedges on a large baking tray and bake for 30 minutes, turning occasionally. 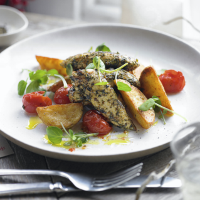 Place 150g cherry tomatoes on a small baking tray and roast for 10 minutes, until softened. Meanwhile, heat a griddle pan or frying pan until hot and add the chicken. Reduce to a moderate heat and cook the chicken for 10 minutes, turning fillets over occasionally, making sure they are cooked through and there is no pink meat. Serve with watercress.